fashion – Page 2 – Hayley Over Heels. Hello!!! I hope you all had a fabulous weekend! My boyfriend, Juan, came to visit me this weekend and we had a great time together (like that’s anything new though *I say as I giggle and blush like a giddy school girl*). I worked most of the time that he was here, but we would rather get to see each other for a little bit than not at all! Also another random thought, I found out last week that you can get your fries well-done at Chick-fil-A. I hate when I get fries from there and they are all soft and mushy. But when you get them well-done, they are guaranteed to be crisp! It’s amazing! To say that this newfound knowledge has changed my life wouldn’t exactly be a lie. Okay, now onto the actual purpose of this post. These blog pictures turned out to be some of the best I’ve taken in a long time! I just love this outfit! It’s really stylish, but still so comfortable. I borrowed this top from my mom’s closet, and it’s currently on sale for over 40% off! Also, I know these jeans are really expensive (I got them through my job), but if you are looking for a great investment pair of jeans, these are amazingggg. They are so soft and comfortable, and the subtle rips throughout are the perfect touch. I love them!!! I am wishing you all a great rest of your week! And if you try your Chick-fil-A fries well-done let me know! Hey, pals! I hope you all have been doing well!! I am in a super good mood today because I checked the status of my passport this morning, and it is on its way to me!!!! I will give y’all a sort of brief background of the passport drama that I have been experiencing the past month or so. For those of you that don’t know, my boyfriend, Juan, and his family are from Medellín, Colombia, and around the holidays, we made plans to make a trip there this summer with all of his family and I. I have never been out of the country before, so this trip is a huge deal to me! Not only because it will be my first trip out of the country, but because I can’t wait to see the country where the love of my life was born, and to be immersed in the culture that his family has welcomed me into with open arms ever since we started dating over four years ago. Since I have never traveled out of the country, I have never had a passport, so I applied for my passport a little over a month and a half ago, giving me a little over 2.5 months to get it! Well apparently what I had always thought was my Texas birth certificate, was actually a Texas birth card, so basically just a short form birth certificate. I got a letter in the mail from the passport agency telling me that they cannot use a birth card to issue a passport. So ever since I received that letter, I have spent the past 3.5 weeks scrambling around to get a copy of my birth certificate. Oh yeah, and crying too. Like a lot. I don’t handle stress well at all, and have always been a worrier. But after finally getting my birth certificate (thanks to the help of my grandma!! Hi, Nonnie!!! ), I checked my passport status today, and it is on the way to me!!! Thank the Lord!!! I feel so relieved and feel like I can actually be excited about the trip now! In fact, I’m so excited that I’ve already started planning my packing list! Keep in mind that the trip is over three weeks away lol. Speaking of my packing list, this dress is on it! (Can I get a round of applause for that smooth subject transition??) It is so comfortable and flowy, which is why I want to take it with me to Colombia. It’s going to be really hot, so I am planning on packing a ton of dresses and shorts. I also plan on eating more than my fair share of arepas on the trip, so flowy dresses are a must. I hope you are all having a great week!!! Do any of y’all have passport drama stories? Or is it just me who is gets stuck in these foolish situations? Happy Monday, everyone!! I hope you all had a great Mother’s Day! Thankfully, I have been in Charlotte all weekend, so I was lucky enough to get to spend the day with my mom. I cooked a huge dinner for her yesterday, with the help of grilling duties from my dad. My dad grilled steaks, and I cooked chipotle shrimp skewers with grilled pineapple, grilled asparagus, stuffed mushrooms (which are always a HUGE hit), knock-off Red Lobster biscuits, and white Texas sheet cake. Geez, I’m feeling fat just thinking about it haha. I LOVE to cook, and any excuse I have to cook for others, I will take it. Not to brag or anything, but I outdid myself in the kitchen yesterday lol. How perfectly does this outfit go with this yellow Charleston house, by the way? That’s the best part about taking blog pictures in Charleston. There’s so many options for scenic photos, and you can walk just a few houses down and get a totally new location. The thing that isn’t good about photo shoots in Charleston, though? The humidity. I feel like the humidity has really held off the past couple months, but alas, it has arrived. Man, I’m really looking forward to months and months of bad hair days (#sarcasm)! I hope you all had a great weekend, and also a great week ahead of you! I have some really cute outfits coming to the blog this month that I can’t wait to share, so stay tuned! And if you have any recommendations for posts you would like to see, please let me know! Hello, pals!!! I want to start off by apologizing for how pale I am in this post haha. What do you do when you hate being pale, hate laying out, and also hate using self tanner? What I usually end up doing is staying pale, and then complaining about how pale I am to everyone that will listen (that is an over-exaggeration, but you get the point). Anyways, hopefully by the end of this summer I will be a bronze goddess, but we shall see. If you follow me on Instagram, you may have seen this yellow dress in one of the try-on sessions that I did on my Stories. For those of you that didn’t see it, I love everything about this yellow dress except for one thing, and that thing is that the dress is completely backless. If I had a slim, toned back, this wouldn’t be a problem, but this is not something that I possess, so I am not a huge fan of the backless look. This is such a shame, because everything else about this dress is so flattering, and it is so light and airy! To fix the backless issue, I paired my new favorite denim jacket with it, and alas! My problem was solved! This jacket is AMAZING, let me just tell you that. It comes in two other washes, and is $39.99. I can’t recommend this jacket enough. It is really amazing quality, and for such a good price. I am also really glad that I got it in the lighter wash as well, but I definitely plan on getting it in one of the darker washes eventually! I hope you are all having a good week so far! I am headed to Charlotte tomorrow for a very long weekend and I am so so so so so so excited!!! I get to see my boyfriend, my family, and all four of my dogs! I haven’t been home in forever, so I really am so happy to finally be heading there. My trips home are also my time to be extra stylish, because I can finally wear clothes that aren’t work clothes or athleisure, so you know that I already have all of my outfits picked out. Follow me on Instagram if you want to see what I wear everyday! Have a great week! Hello pals! It feels like it’s been forever since I’ve written a blog post. In reality, it’s only been maybe four or five days, but it still feels like it’s been a long time! Although the only reason why I haven’t been very active on the blog the past week is because I hadn’t had the opportunity to get photo shoots done, it was nice to sort of soak up the free time. I am finally done with school for this semester, so you can all breathe a sigh of relief that you won’t have to waste on eye rolls on me while I whine and moan about it anymore…at least until August. Being out of school along with the added bonus of being able to sort of unplug from my little internet realm, has been very relaxing, lemme tell ya. Today’s post is a fun one because I am sharing a really cute jewelry line with y’all. If you are a Charleston or Mount Pleasant local and have ever shopped at Copper Penny, then you may have seen this jewelry before! The brand is Whitley V, and all of their jewelry is handmade here in Chuck Town. I really enjoy their jewelry, and I love how they have a great mix of different styles to pick from. 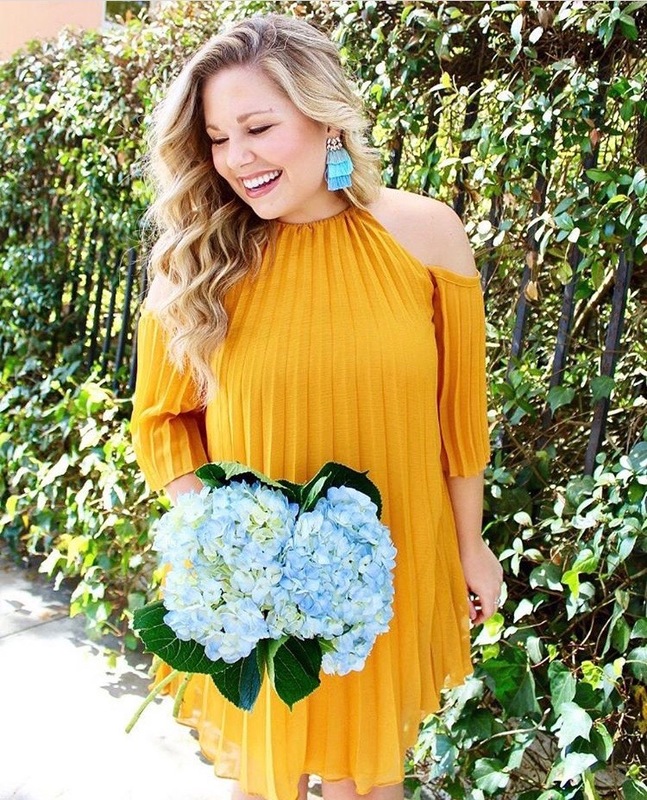 They have a really wide variety, and whether it’s a chunky stone necklace, a delicate chain necklace, or fun tassel earrings, pretty much anyone can find a piece that suits them. My favorites are the turquoise tassel earrings, for sure! You know I rocked those bad boys on Cinco de Mayo all day, dude. Shop Whitley V products through their site, or at the boutique, Copper Penny, if you are in the Charleston/Mount Pleasant area! I hope you all have a super awesome week!